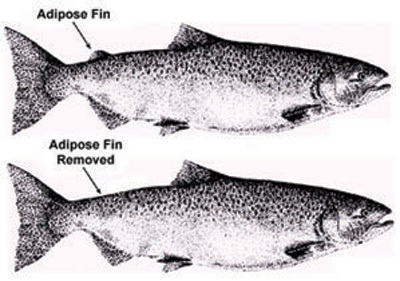 * Fish Fin Designed by God: A dorsal fin, called an adipose fin, on some fish was thought by evolutionists to be a left over (vestigial) structure from its evolutionary past. Believing this to be so, biologists in fish hatcheries would cut these fins off thinking it would help the salmon survive better in the wild. It has now been shown that fish with that particular fin still attached are better swimmers. At one time, evolutionists believed that there were over 100 so-called vestigial organs, glands, or structures in the human body. Practically all have now been shown to have important functions with the trend indicating that the evolutionary assumptions here will have been wrong every time. 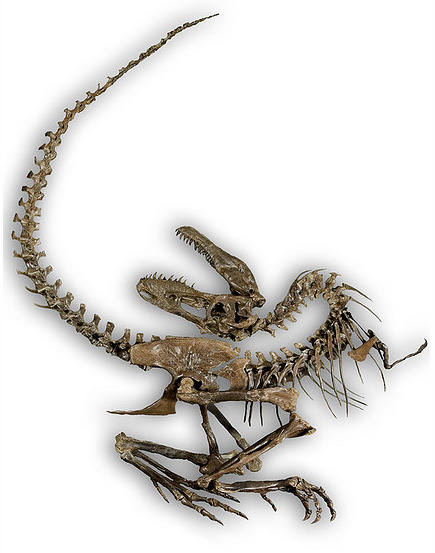 * Dinosaur Death Pose: Fossils of dinosaurs all over the world are found with their necks and heads bent backwards. Experiments show that the necks and heads of dead birds today that are buried in watery graves also bend backwards in the same manner. 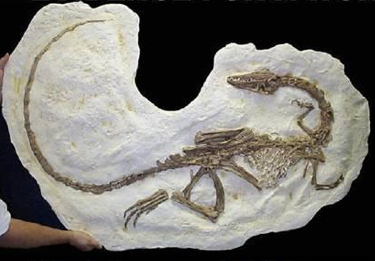 This is additional evidence supporting the creationist assertion that these articulated dinosaur skeletons were buried in a flood -- a big one. Bob asked if anyone in the audience would be willing to replicate one of the quail experiments mentioned. See this also at New Scientist. * Old(er) Bird: Once again the evolutionary time line is set on its head. 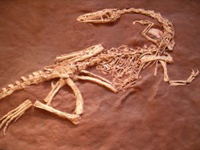 This time by a find in China in which a bird fossil is said to be much older than the supposed first bird, Archaeopteryx. * Humming Bird Beaks: The beak of a humming bird is very flexible and can snap shut at an amazingly-fast speed (in just one-hundredth of a second), allowing for the bird to catch those pesky but very fast fruit flies. * Concrete that Bends: Scientists have developed concrete that bends and heals itself. "Sidewalk, heal thyself!" These inventors used knowedge gleaned by observing God's amazing designs in the natural world (know as biomimicry). * Global Warming Making It Colder: Seventy-nine degrees below zero in Alaska! Just thinking about it makes a person cold. The all-time record cold in Alaska is eighty below zero at Ft. Yukon in 1971 -- just one degree colder than it got just a few weeks ago at Jim River, Alaska. Dr. Roy Spencer says global warming is not man-made and NASA satellites show that more heat than previously thought is being released to space. Over 31,000 American scientists agree that the man-made global warming claims are not the result of good science and have publicly affirmed their opposition to the hype by signing the Global Warming Petition Project. 1. Our newest monthly subscription is our Monthly Sermons on audio CD. For many years we have offered the sermons on MP3-CD, but now you can get the Monthly Sermons on standard audio Compact Disc that will play on any CD player, including the one in your car. All of the sermons from the month will be sent to you in a multiple CD album. 2. Monthly Bible Study Videos - You will receive a months worth of weekly Bible studies each month. These video Bible studies are great for starting a family Bible study of even a neighborhood study. 3. Monthly Sermon Videos - You will receive all sermons from the month will be sent to you on DVD. Video is a great way to watch the sermons with your family. 4. Monthly Bible Study Audios on MP3- CD. 5. Monthly Sermon Audios on MP3-CD. 6. Monthly Topical Videos - Each month your will get one of Bob's great topical videos. 7. Best of Bob - Each month you get the best 8 shows of the month on MP3-CD. * Free Gift: When you subscribe to any monthly subscription, new monthly donation of $20.00 or more or a one time donation of $50.00 or more, we will send you Bob's video series Having a Great Prayer Life.